As you were preparing for your December holidays, what traits did you exhibit that are synonymous with almost every household across Africa? Do you plan your trips around the LSM, the business market has placed you in? What holiday habits would a B2C marketer capitalize on to make sure the market responds to their marketing tactics and how would these habits prepare a diligent marketer for 2017? We capitalized on the power and reach of the Geopoll app hoping to understand what holiday habits different sects of people adhere to and were able to reach a substantial number of respondents in different African countries including Kenya, Tanzania, Uganda, Ghana, Nigeria and South Africa. Most African countries are without a doubt the epitome of beautiful and majestic sanctuaries that are hotspots for international tourists. Tourism, being a major backbone of major economies, has been crippled by terrorism. A dark shadow on most economies. It has successfully seen the tourism sector crippled leading to loss of jobs which has raised unemployment levels through the roof and consequently a dip in the GDPs. Most African governments have embarked on a journey of promoting domestic tourism as opposed to purely international tourism, but will the coin flip be of help to these rapidly developing countries? Has this borne any fruits or is the government trying to have the cake and eat it too? How many people understand the need of travelling to different spots within their own countries and having the satisfaction that comes with being a tourist? With this survey, we shall look at all these countries and see what gives. In Kenya, the tourism board launched the #TembeaKenya hashtag earlier on this year and the market has responded accordingly. There has been a lot of engagement and appreciation of the country by its citizens as seen on different social outlets. Tembea Kenya loosely translates to “Visit Kenya”. It was a form of amalgamating the need of sharing on social media especially by millennia’s and in the process fostering a culture of touring the country. This campaign has had a huge backing from the government through the Ministry of tourism and has seen numerous efforts set up for it including familiar faces championing it. But what keeps people from taking holiday breaks and becoming the domestic tourists the government is trying to convert? Money constraints and work commitments are the top main reasons with lack of time and family commitments following in closely. Without a doubt, most Kenyans, will not be leaving the country and contrary to the past social norm, only 25% will be travelling to the coastal areas for both Christmas and New Year’s festivities leaving a good 38% to travel to different cities but within the country. 36% of Tanzanians and 45% of Ugandans will be having their holiday festivities within the country but outside their main cities too. Thus major traffic snarl-ups will be experienced as the exodus from the urban areas to rural areas makes way. The importance of digital marketing and online presence for any company looking to make it in the 21st century is not only a requirement but a vital necessity. 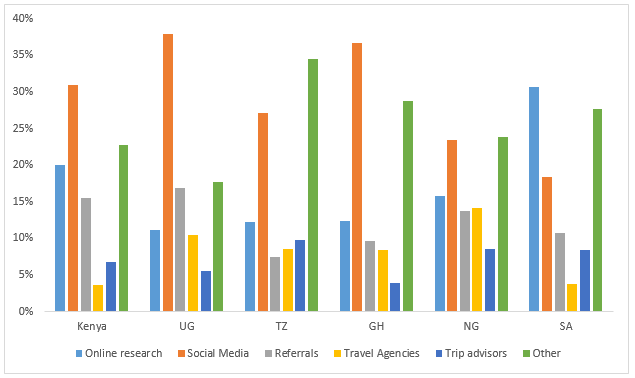 This is echoed by the fact that both online search and social media were channeled more in search of the perfect holidaying spot. A good 65% of Kenyans, will be taking public means to their holiday spots as will 69% of Ugandans and 78% of Tanzanians as opposed to private means or air travel. The rest of the 4.1%, 12% and 8% of Kenyans, Ugandans and Tanzanians respectively will be travelling by air. The future might still be bleak for major air couriers like Kenya’s KQ which have been banking major loses over the previous periods. This is due to the fact that for every person booking a KQ ticket there are 4 tickets from Jambo Jet or Fly 540 that are getting booked. To many, companionship during family centered holidays like this is vital to many hoping to take the break. Who will you be travelling with during the holidays? 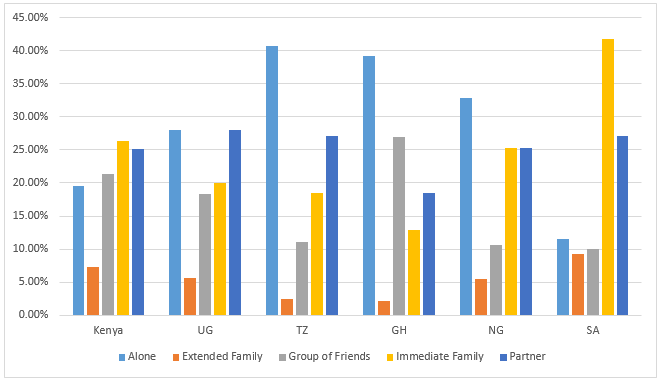 42% of South Africans will be travelling with their immediate family as opposed 41% of Tanzanians who will be traveling by themselves. How are Kenyans hoping to beat January blues after a lot of spending during the December holidays and New Year festivities? 45% of Kenyans mentioned that they have saved enough while less than 1% say that they will be procuring loans from mobile institutions such as Branch and Mshwari. Point to note is that these are not bank loans but loans procured solely on hand held devices. On the other hand, only 17% of Ugandans and 23% of Tanzanians have set aside some amount that should be expected to take them through the first month of the New Year. Remember: The New Year stands before us, like a chapter in a book, waiting to be written. We can help write that story by setting goals. ~Melody Beattie.